All my favorite stuff in one drink. The coconut oil gives the coffee a smoother, less bitter taste, and the cinnamon fools my taste buds into thinking that I’m digging into a cinnamon bun! The last drop of this coffee is especially wonderful as the cinnamon at the bottom of the cup will leave a great sweet treat. 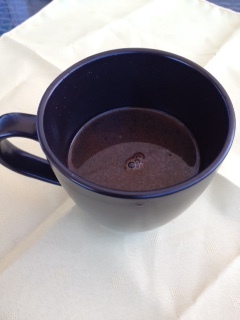 In a coffee mug, add cinnamon and coconut oil and mix well. Add freshly brewed coffee (about 8 oz). If you prefer a larger cup of coffee, add more cinnamon and coconut oil to taste. Stir coffee until well combined with oil and cinnamon. Stir between a few sips to continue to blend, as cinnamon will settle at the bottom of the cup.